Lulemee’s repaint versions of three classic Audrey Hepburn film roles. 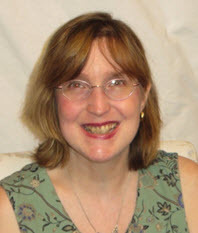 Lulemee is an independent OOAK artist. 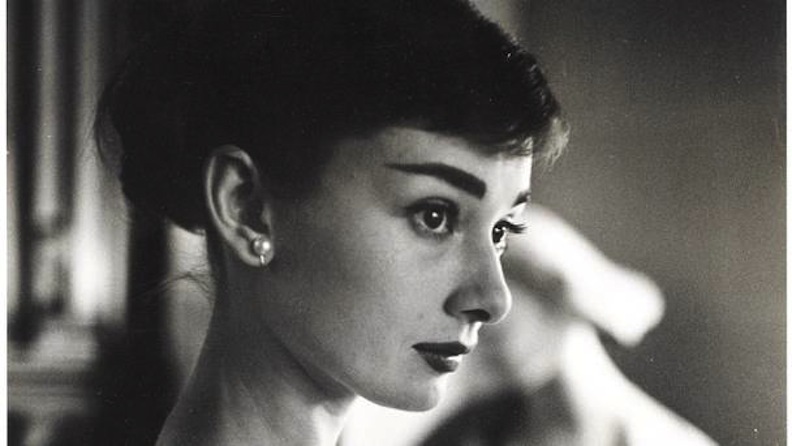 Born in Belgium May 4, 1929, Audrey Hepburn would be turning 89 years old, if she hadn’t departed our world in 1993. It’s difficult to believe that Hepburn died 25 years ago—the anniversary of her death was Jan. 20. However, Audrey Hepburn remains very much alive as a collectible doll, a favorite among manufacturers and repaint artists alike. 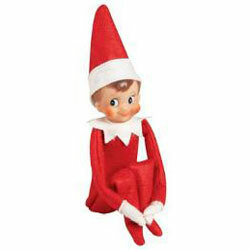 She also is highly sought after as an image on collectible giftware, posters, and coffee-table books. 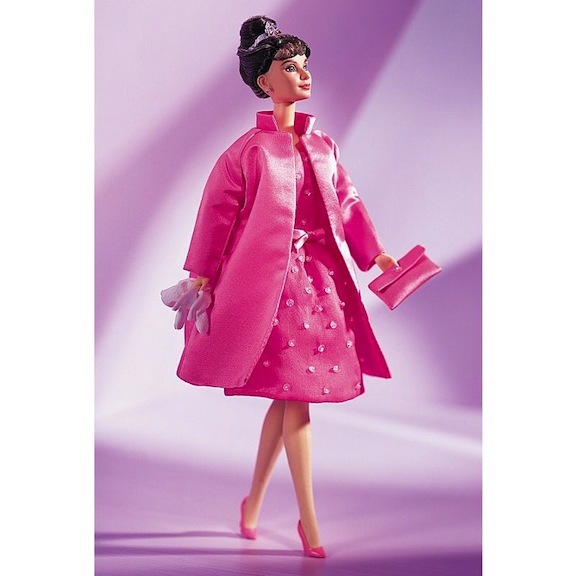 When it comes to eternal elegance, Hepburn is the “it” girl, especially for doll designers smitten with fashion. Folks bewitched by the twig-thin actress will have a field day in the upcoming week, which promises to be a Christmas extravaganza for fans willing to browse and bid. Most uniquely, in honor of her impending birthday, there will be an online auction of her personal effects, hand selected by her two sons. 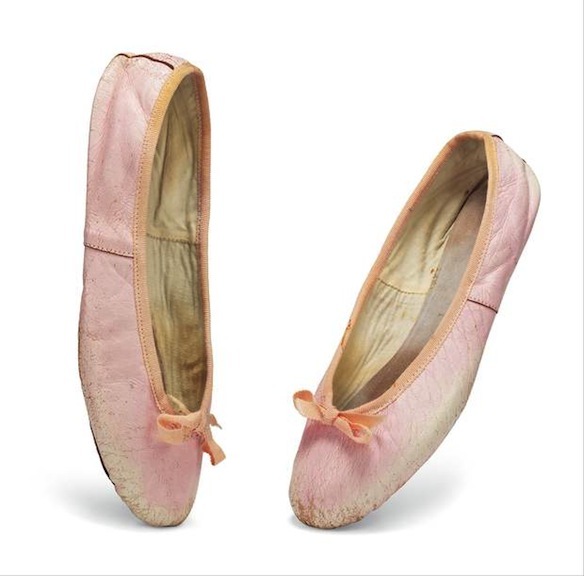 Curated and promoted by London’s Christie’s auction house, the items are as intimate as jewelry worn and preserved by the actress, silk flowers from her personal stash, correspondence, portraits, clothing, and ballet slippers. With some lots beginning at a mere $400 U.S., here is a chance for fans to actually walk in the shoes of their beloved star. Hepburn didn’t begin life as a celebrity. Born into a troubled household, just as the worldwide depression had struck, young Audrey had parents who were constantly at odds with one another. When her father walked out on her mother, Audrey couldn’t help but think he had abandoned the family because of something she had done. “I felt that I was at fault somehow. I tortured myself with what-if’s. I thought if I had been different somehow, better somehow, he would have stayed,” she admitted in interviews over the years. 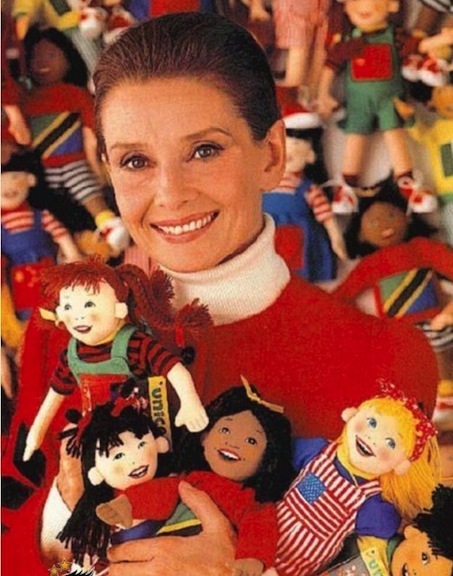 The decision that her father made impacted young Audrey, and she always nurtured an inner child that felt “not quite good enough.” This was a lack of self-confidence and a dose of insecurity that colored her personal life as an adult and her professional life as an entertainer. She would always second-guess herself. Living in Belgium, and then Amsterdam during World War II, Audrey endured the deprivations of food scarcity and a dearth of medical attention. Subsisting on a sub-par diet, Audrey developed severe anemia and also suffered from malnutrition. She was emaciated for many years, and even after the war had ended and food was plentiful, she could not bring herself to eat with any gusto. She felt guilty for having survived while so many children, teenagers, and other countrymen died. Understanding the plight of children during wartime, Audrey gravitated to children’s charities throughout her life. 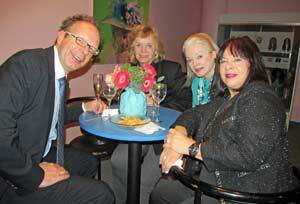 Her work with UNICEF was legendary, netting her humanitarian awards and global recognition. She didn’t do it for any personal glory; she did it because she felt it needed to be done. This empathy toward the less fortunate, and a remembrance of her own misfortune, helped Hepburn in her on-screen roles. Her waiflike vulnerability and her gamine good looks earned her the adulation of a movie-going public that never stopped loving her. 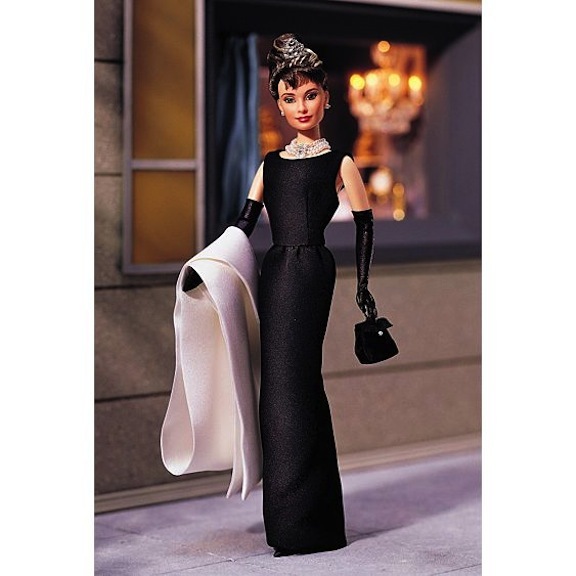 Mattel’s first “Breakfast at Tiffany’s” doll featured Audrey Hepburn’s iconic black Givenchy gown. 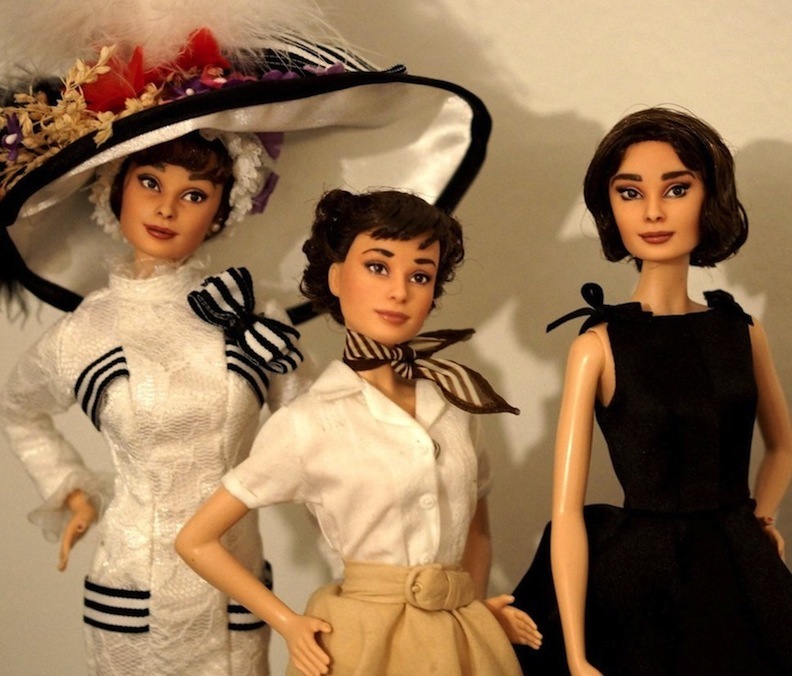 When Mattel made Audrey Hepburn into a fashion doll in 1998, I was lucky enough to write about its debut for DOLLS magazine. (Can you believe that was 20 years ago?!) 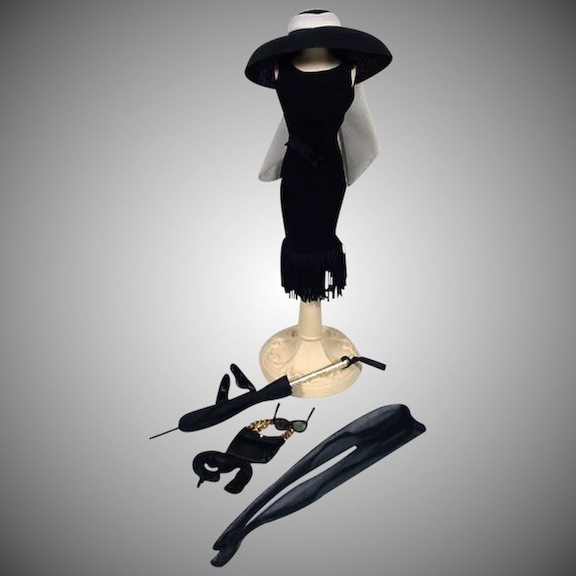 At the time, her son Sean Hepburn Ferrer was very involved in the selection of which costume that should be made as the first official Mattel doll: it ended up being the long black Givenchy gown that she wore in “Breakfast at Tiffany’s.” That black ensemble is one of the most evocative costumes in film history, and it has a touchstone connection to Audrey’s own impoverished youth. Even though she is swaddled in a necklace designed by Roger Scemama, decked out in Givenchy, with a little help from Edith Head, and sporting black sunglasses and long sleek gloves, Audrey said that opening sequence made her sad and uncomfortable. Called upon to drink coffee and nibble on pastries as she wends her way up Fifth Avenue, gawking at the jewelry that sparkles in the Tiffany’s show window, Hepburn was sick to her stomach. She didn’t like to eat in movies. She felt the way food was wasted on the set—thrown out when half nibbled because of editing continuity; producers monitoring and measuring how much was consumed to match its appearance in take after take—it brought back associations with her years as a half-starved war child. While in the Netherlands, she and her family had to use tulips and tulip bulbs as the basis of many meals. Being asked to eat for the cameras was always a problem for her, and she made that displeasure clear. 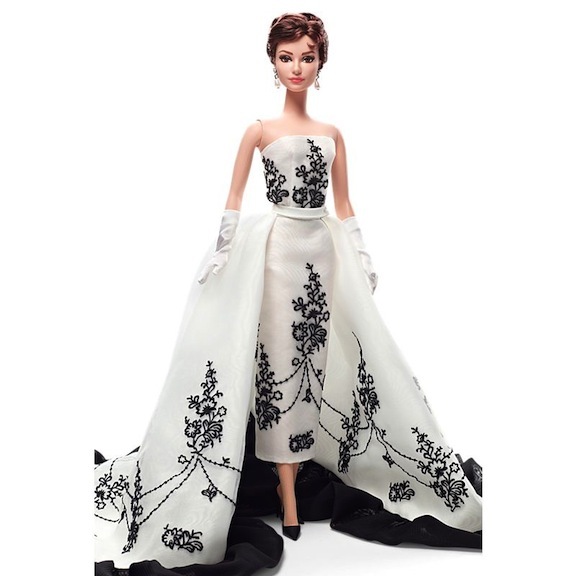 The “Breakfast at Tiffany’s” gown was Mattel’s first release in their Audrey Hepburn doll line. Interestingly, that iconic dress was also among one of the first Hepburn possessions auctioned at Christie’s. 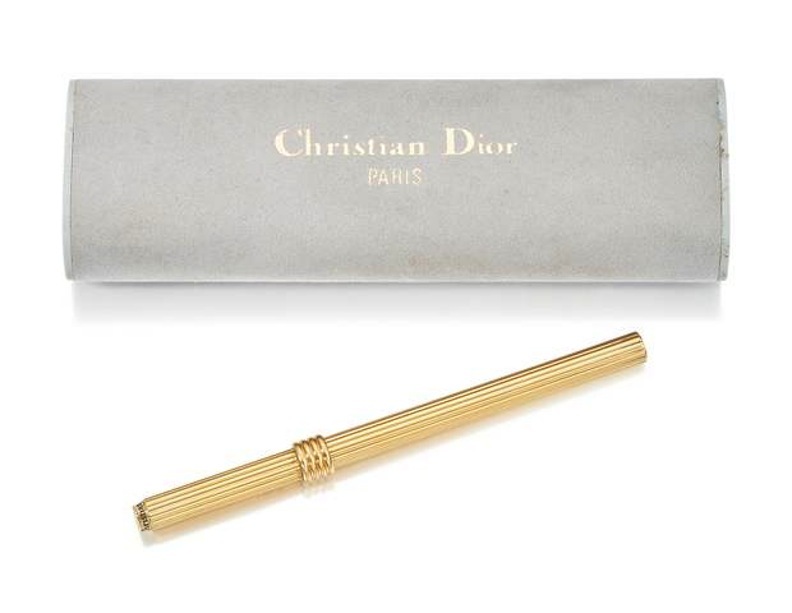 In 2006, it went up on the auction block with a large amount of fanfare and anticipation. The press reported that it was expected to fetch around $100,000. 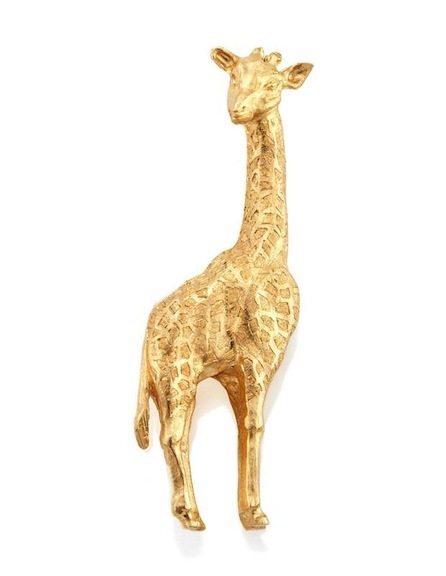 Instead, it ended up being bought by an anonymous bidder for $923,187. The proceeds from that sale went to build a school for children in Calcutta. That’s something that would have made Audrey quite proud, especially because she graduated from being a goodwill ambassador for UNICEF to becoming the namesake of her own US Fund for UNICEF, the Audrey Hepburn Society. It’s that association with children, and seeming forever young and Peter Pan–like herself, that has kept Hepburn as a pop culture princess. New young people of every generation flock to her. After the initial launch of the 1998 black-gowned doll, Mattel followed it with two outfits-only sets: the orange Cat Mask costume and the black daytime ensemble. Both were instantly recognizable to the Hepburn and classic-film fan. A year later with the aptly named “Pink Princess Fashion,” a pretty pastel costume that her character Holly Golightly also wore in the Tiffany’s film. 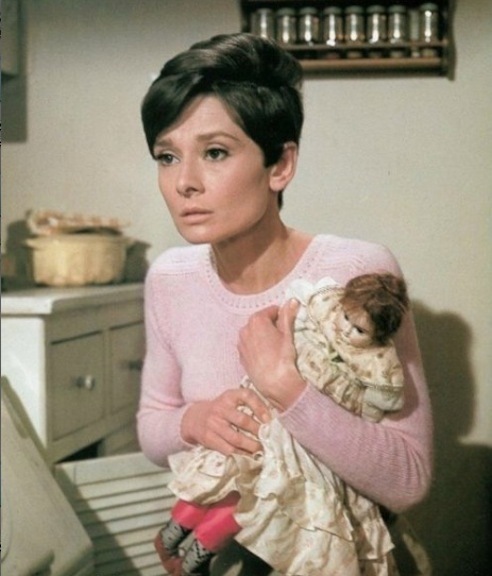 Mattel revisited the cinematic canon of Audrey Hepburn twice more after that. In 2013, their premier designer Robert Best plied his craftsmanship in concocting two of her most essential roles. 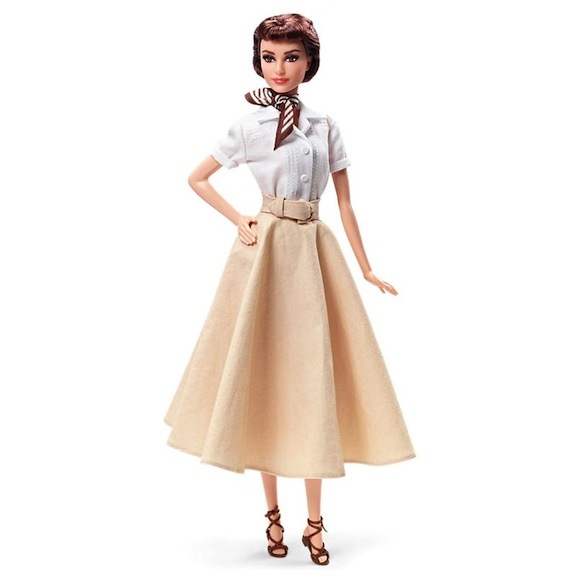 The “Roman Holiday” doll was available as a creation for collectors of all ages. 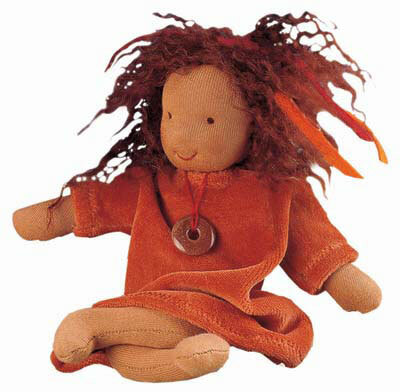 Safe for ages 6 and up, it captured her wholesome look as the pixie-like and fun-loving royal on the run. Scooting around Rome with reporter Gregory Peck, Hepburn was a delight as a princess who wants to know how it feels to be a regular woman. Going incognito, she falls for a handsome American journalist and has to choose between obligations and the monarchy. 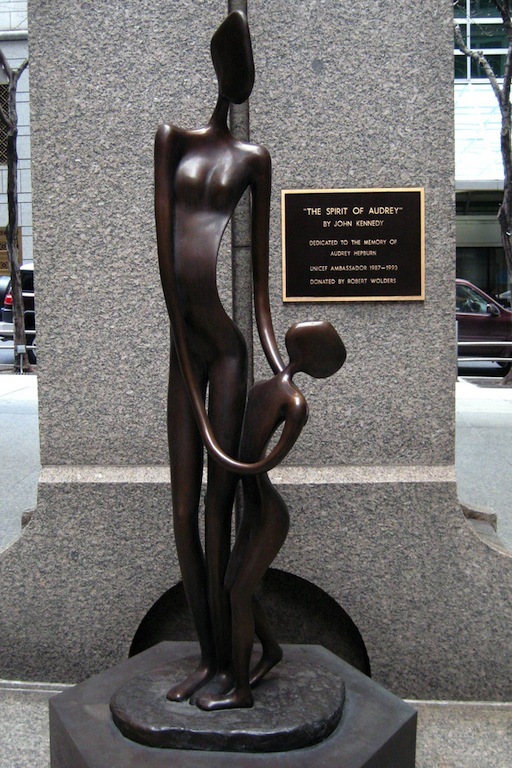 Hepburn won an Academy Award for this portrayal. In this movie, Sabrina is the daughter of a chauffeur who can only dream about what it must feel like to be one of society’s swells. Sent away to learn how to become a blue-ribbon chef, she returns home from Europe to her father’s swanky employers’ estate. Now grown up, and having blossomed into a haute couture goddess, Sabrina catches the eyes of the rich family’s two eligible sons. Hepburn’s co-stars in this romantic comedy are William Holden and Humphrey Bogart as the Larrabee brothers. The Christie’s auction, which will run from May 2 to May 9, features more than 200 lots from her personal archives, and a remarkable array of items is on hand from these memorable movie roles. Perhaps a doll designer from Mattel, or Ashton-Drake, Paradise Galleries, or Tonner, to name a handful, will participate and walk away with the winning bid on some of her outfits that are going under the gavel. 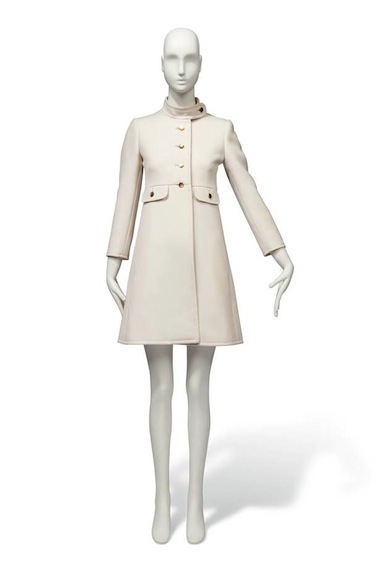 One of Hepburn’s favorite accessories, her ivory-wool gabardine coat will be at the Christie’s auction in May. Hepburn’s son Luca Dotti said his mother preferred pearls to all other gems because they were made so effortlessly by nature. Her pearl earrings are being auctioned by Christie’s.